We have a lot of brooches in our collection. 156 to be precise! These brooches date from between the Iron Age to the Medieval period, but the majority are from the Roman period (AD43 to AD 410). All of our brooches are made from copper alloy, (which is copper mixed with tin or zinc to produce bronze or brass) but some are also decorated with glass or enamel. Others have a white metal coating, to make them look like silver. Two of the brooches in our collection are gilded, which is a thin layer of gold covering the surface of the brooch. 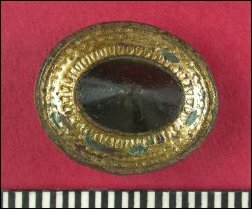 Example of a gilded brooch with glass inlay.